“Yob might be one of the best bands in North America,” declared Ben Ratliff in a feature New York Times article in March of 2010 that can be best described as gushing. The Eugene, OR-based doom metal trio has seen similar praise worldwide, with a growing host of fans citing the band as one of the most profound and accomplished doom metal phenomena of the 21st century. It’s all too rare for a band to reach such moderate success and massive acclaim based on sheer quality of music. There’s certainly no overt commercial bow on any of YOB’s five albums. Songs commonly stretch beyond the twenty minute mark, and to date there’s never been a radio edit or any effort to appease anyone but the band’s muse. Indeed, the shortest song on latest album opus The Great Cessation clocks in at over seven and a half minutes of bludgeoning heaviness and cosmic wandering. 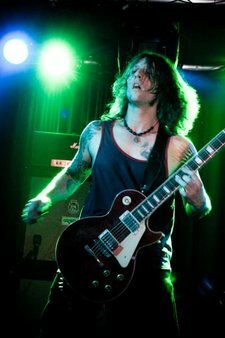 The journey began back in 1996 when vocalist/guitarist/songwriter Mike Scheidt began composing classic doom metal riffs in the vein of his heroes Sleep, Cathedral, and Black Sabbath. By the turn of the millennium, the band had recorded debut album Elaborations of Carbon, and was rapidly growing from a NW secret, to a highly sought after support act for tour stops by luminaries like High on Fire and Isis. By 2003, Candlelight had the rights to sophomore album Catharsis, a record with a side-spanning title track that breaks twenty-three minutes into a heartbreaking odyssey. Upon completion of Catharis, Scheidt invited drummer Travis Foster to join the band, and Foster’s immaculate percussive force became a signature element in YOB, as fundamental to the sound as Scheidt’s alternately monstrous growls and triumphant, soaring wail. Full US tours commenced due to a symbiotic partnership with then-fledgling Nanotear booking agency. YOB proved to audiences night after night that it had chops and sonic glory to deliver that exceeded the promise of its albums. Brian Slagel of Metal Blade records took note, and the man who discovered Metallica, Slayer, and Voivod took YOB under his wing. Two fantastic albums were released, 2004’s The Illusion of Motion, and 2005 masterpiece The Unreal Never Lived. By this time, YOB had shed the sound of its early influences, and was in turn creating a new and original doom sound that would in turn inspire others from around the world. Then YOB went into reclusion as the line-up shifted, and Mike Scheidt took several years to regroup and try his hand at other projects. Scheidt is a family man living in a small town, and in the real world, there are bills to pay. He trained hard in a form of Israeli self-defense called Krav Maga, eventually becoming an instructor. Between teaching this grisly martial art and reading extensively in eastern philosophy, Scheidt struck a fine spiritual balance which has led to seemingly endless creative inspiration. In 2009, YOB awakened from its slumber, adding bassist Aaron Rieseberg and releasing the surprising and long-awaited The Great Cessation. The reformed band’s debut for Profound Lore records proved that YOB had retained every ounce of inspiration, and was recognized on nearly every year-end list, from the Village Voice to Terrorizer. More surprising still was how much YOB’s legacy had grown during its hiatus. Invitations to perform at Scion Rock fest between Shrinebuilder and Pelican were followed by the unprecedented response at YOB’s first European appearance at the fabulous 2010 Roadburn festival in Holland. The day YOB touched down in the Netherlands, a volcano in Iceland erupted—but Scheidt is no stranger to catastrophe, and the band took its stay in stride. Seemingly dictated by nature itself, Europe wanted more YOB—and it got more. Gigs were added in Germany and Belgium, and with only two days notice, curious crowds arrived to witness the finest cosmic doom on the planet.